Being an avid foodie, I’m often lenient with what I put in my body, in fact I rejoice in the prospect of heaping piles of food that contain little nutritional value. Naturally, I was skeptical when I heard the cooking lineup at Sophia Camp. However, after my first bite of vegan tacos I underwent a change of heart that simultaneously broadened my culinary horizons. Our resident chef Melissa Martin provided an eclectic variety of foods that were not only delicious, but paid homage to the “healthy-living” notions championed at Sophia Camp. Martin cooks with a sort of passion that makes her food exciting and original. Her daily lunches represented healing properties centered on the doshas as well as worldly influences that allowed vicarious experiences of diverse cultures. As the days progressed lunch gradually became my favorite part of the day and I approached each meal with readiness that contrasted my initial reluctance. Luckily, I had the chance to speak with Melissa Martin, and discuss how she fostered such an immense talent. What first prompted you to begin cooking? Melissa Martin: My Mom is an amazing cook and used to make dinner every night when I was growing up. We would always eat together as a family, so healthy home-cooked meals have always been a big part of my life. But it wasn’t until a few years ago that I really started to become interested in cooking for myself. After college, I began working as an account executive for a cosmetics company. I worked long hours and traveled on the weekends, and didn’t have much time to cook or prepare healthy meals. I dined out a lot and relied on convenience foods and lots of coffee to keep me going. Over time it definitely took a toll on my health. After I left that job and had more time to focus on my health and well-being, I discovered yoga and began to embrace more of a whole foods, plant-based vegan diet. I joined a CSA (Community Supported Agriculture) and received weekly deliveries from a local produce farm and began to teach myself to cook with the seasonal vegetables that I was receiving. I never knew what I was going to get until I opened the box, and often times I was faced with vegetables I’d never seen or heard of (like nettle, kohlrabi and okra to name a few) so I was forced to think outside the box and experiment a lot. I absolutely loved it. I began creating my own recipes and eventually my blog vegenista.com was established as a place where I could share my recipes and tips on consuming a healthy vegetarian and vegan diet. Cooking became a new-found hobby and I began getting together regularly with my Mom to cook and play together in the kitchen. Now, together, we do most of the cooking and menu planning for holidays and family gatherings. Why are you interested in Vegan/Vegetarian cooking? MM: I believe that a whole foods, plant-based diet is the healthiest way to eat – not only for our bodies, but for the overall well-being of animals, and the health of the planet as well. When well planned, we can get almost all of the protein, vitamins and nutrients we need from plants alone. It is proven that with a vegetarian diet we can ward off disease and obesity, and studies show that we be stronger and live longer when we consume a vegan/vegetarian diet. For me, it’s more than just a dietary choice. I am vegetarian for social and ethical reasons, as well. As a yogi, the moral precept principal of Ahimsa (non-violence/non-harming) is an important part of my life, so a vegetarian lifestyle is essential to me, and I strive to do my part to not contribute to the harm or our planet and suffering of sentient beings. From an environmental perspective, meat production is one of the biggest contributors to global warming, and animal agriculture is one of the leading contributors of deforestation and pollution. And during this time of extreme drought, it is important to point out that factory farms use an unnecessary amount of water and resources – for instance, on 1/4 lb. hamburger takes 660 gallons of water to produce (equivalent to taking a shower for a whole 2 months!). From an ethical perspective, without getting too graphic, there is a considerable amount of cruelty and suffering inflicted upon animals who are born, raised, and eventually slaughtered for our consumption. From a social perspective, about 70 percent of all grain, corn and soy produced in the United States is fed to animals raised for consumption. If all the grain currently fed to livestock were consumed directly by people, we could essentially end world hunger. I try to live as consciously and compassionately as possible, so I keep a mostly vegan home (no animal products except for ethically produced ghee and local honey) and am vegetarian out in the world. How did you end up working at Sophia camp? MM: I am in the process of becoming a registered yoga teacher and have been studying with Laura Plumb and the Deep Yoga School of Healing Arts. Laura pulled me aside one afternoon and asked if I would be interested in helping out in the kitchen for the camp. I am in education, so I was still off work for the summer and thought it was an amazing opportunity to not only give back, but be able to share my love of vegetarian and ayurvedic food with others. What do you appreciate about working in an all women’s environment? MM: I loved the coming together of the kind and creative feminine energies, and enjoyed the camaraderie that we all shared throughout the Sophia experience. Teenage girls are faced with the growing pressures to fit in, and to look and be a certain way. I think it is so important that teenage girls are given the resources to positively change the way they feel about themselves by cultivating greater self-esteem, confidence, inner freedom, fulfillment and joy. I also think it is so important to learn about wellness, a healthy diet and self-care at a young age, so these practice can begin to be integrated during one of the most important times of growth and transformation in a young girls’ life. It was inspiring to see so many women from different backgrounds come together to share wisdom and knowledge. It was such an honor to be a part of the Sophia Camp! What are your future plans in regard to coking? MM: I plan to continue to develop healthy plant-based recipes for my new food blog, vegenistaskitchen.com, and am considering taking some distance courses in cooking with the Natural Epicurean (a plant-based cooking school in Austin, TX) and in plant-based nutrition from the Institute for Integrative Nutrition. 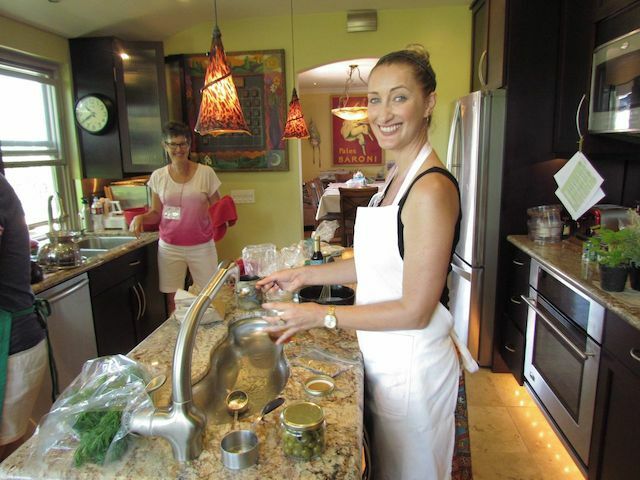 I would love to teach healthy cooking and nutrition classes, especially to children and families. I’ve also always dreamed of opening a yoga studio with a juice bar and raw foods cafe. I have so many passions and interests, so someday I hope to be able to integrate them all into a lucrative business and make all of these dreams a reality! One of the most special recipes was a Buckwheat Salad, a perfect option to placate a light Vata imbalance, if it is summer as it is when we are at Camp, of course. In a small bowl, add dressing ingredients and whisk to combine. 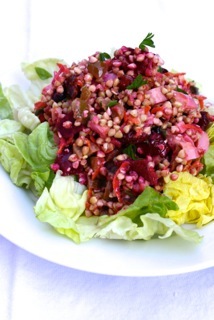 Toss buckwheat groats, beets, olives, hearts of plan and raisins in a large salad bowl. Add desired amount of dressing. Serve over butter left lettuce and top with additional dressing and garnish with herbs. What a beautiful article – Emma Frattasio is such a gifted writer! It was such a pleasure to read your article & to get to know Melissa better – you are both so talented! Thank you!! Coming in a little late with a comment but as I peruse these articles I am impressed with the writing and glad to meet MM beyond our shared seasonal cleanses. As always, grateful to the Institute for Feminine Wisdom for supporting and growing young women into empowered individuals through Camp Sophia for teens. Emma, thank you for sharing Melissa’s environmental and ethical eating choices. We truly can care for our bodies, our animal friends and the planet with gorgeous, colorful, creative plates. I’ve gotten to know Melissa a little better since the Sophia Camp and she really shines. Just like you! I love the questions you posed and the recipe you included here. Keep writing.